This small, inexpensive magazine did not have high quality prints, the print descriptions were brief, and there was no other fashion commentary. It was a very conservative magazine, full of moralistic essays and fiction, and no doubt the editors felt fashion to be a frivolous, if necessary, subject for their female audience. Fashions prints from this publication almost always depicted more than one figure. Sometimes the fashion print was a fold-out page with 4 to 6 figures depicted. Throughout its history, the Lady’s Monthly Museum “borrowed” from fashion prints in other publications, generally the month following their original publication. 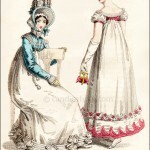 Here, for example, the figures were drawn from two prints in the magazine Fashions of London and Paris from July 1807. Both magazines were inexpensive and would have had similar target audiences. Either the Lady’s Monthly Museum assumed their conservative readers would not indulge in a magazine entirely devoted to fashion, so would not have seen the same fashions the previous month, or they simply didn’t care. The descriptions did not match the slightly more extensive descriptions in the Fashions of London and Paris, another suggestion that fashion was not a priority in the Lady’s Monthly Museum. “Fig. 1.–WALKING DRESS. 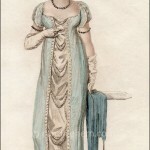 White dress of cambric, with a transparent sleeve buttoned up the arm; buff gloves; bonnet of pink silk; an outside dress ornamented with tassels at each corner. Fashions of London and Paris, July 1807. Click on image to see a larger version. 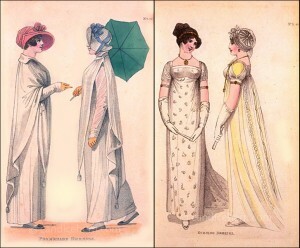 The original prints from Fashions of London and Paris are shown here. Each print shows a slight variation of the same dress. You can see that the Lady’s Monthly Museum did not copy them exactly, but simply used the designs of the dresses in their own arrangement of figures. 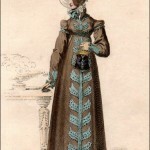 The Full Dress in the Lady’s Monthly Museum print, for example, is shown at a three-quarter angle, not full front or full profile, as in the original. But clearly, it is the same dress. 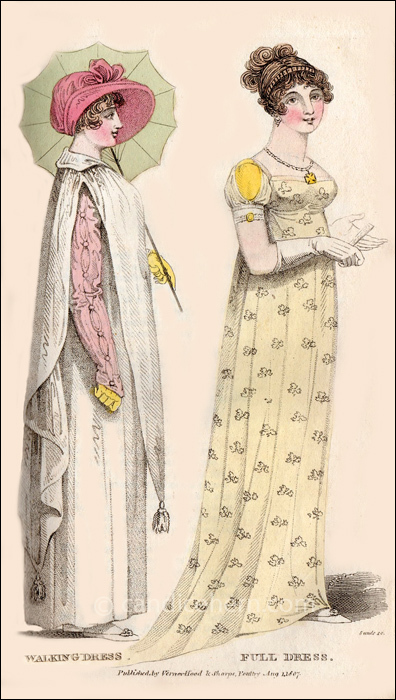 The Walking Dress takes elements from both figures in the original — for example, the bonnet from the left figure and the parasol from the right figure. The descriptions in the Lady’s Monthly Museum are not only extremely brief, but sometimes a bit odd, making one wonder about who wrote them. For example, the Walking Dress is described as having “an outside dress ornamented with tassels at each corner.” In the original publication, it is more correctly described as a mantle.